Updates to Gordon's profile since your last visit are highlighted in yellow. Some of you may recall that in a previous note, Steve and I celebrated 10 years of relationship on 02/27/2011. This is an easy date to remember, because our first date was to watch the Fat Tuesday Riot in Pioneer Square in Seattle. The next day was the Nisqually Earthquake. And so, in spite of setbacks in our personal economy, health and legal areas, we continue to live an active and fulfilling life in Centralia - and things are getting better on all those fronts. I am now serving as a board member of the Centralia Downtown Association, Steve is on the Historic Preservation Commission and we are quite active in our church's life. Last weekend we put on 'Chicken Bingo' at the Historical Museum's Pioneer Pie Social! My job as a Workfirst Case Manager continues to be interesting – because every family has different issues. Jobs are tough to find in Lewis County, so I am on the board of a workshop developed in our office to show folks that they have options to get off of Welfare, that are likely previously unexplored. One of the tools used in this workshop is Lou Tice's 'Positive Thought Patterns.' Somehow it seems different than when it was presented to us by Coach Merrill during PE class in my mid-teens! Steve's salon business keeps him hopping. He has developed a line of skin care products to cross market with his cosmetics. This new line will be launching soon. Little did I think, when I graduated from Kennedy High School in1979, that I my life would be lived in a rural town (What? I'm from Seward Park! ), lunching with the mayor and county commissioners (What? I dislike politics), tossing chickens onto a plywood sheet with numbers (What? I just happened to already have it? Don't chickens carry Salmonella?) and taking bets on where they would poop (What? gambling?). Add to that, married to some guy who I met at a department store (What? ), with stepkids (What? They are turning out rather nicely), living in a big old house (What? Not quite a mansion and I'm a minimalist?) and renting rooms (What? No privacy? We think it is part of our life's ministry) to supplement our salary from working at the Welfare Office (where I have a bowl of condoms on my desk. What? ), and income from a hair salon and make-up company – but What a Life it is! Hometown Parish. This would be the parish or area of town you lived in during 1975-1979. Gordon MacLeod has a birthday today. Gordon MacLeod posted a message. Hallelujah! This is great news, Roger. Thanks for taking the time to update us! Gordon and partner Steve. I'm much younger, but living with him has given me gray hair. 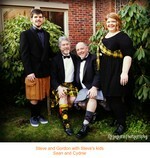 Gordon and Steve, flanked by Steve's son and daughter; Sean and Cydnie. Gordon and Steve, surrounded some of Gordon's family, including Gordon's mother Betty. Our house looks pretty cool in the snow!